It’s happened to all of us. You just got sent on some kind of quest and need to traverse miles and miles to reach our destination. Our horse is getting tired. You’re getting hungry. And in the back of your mind, one gnawing question keeps eating away at you: “Dammit! 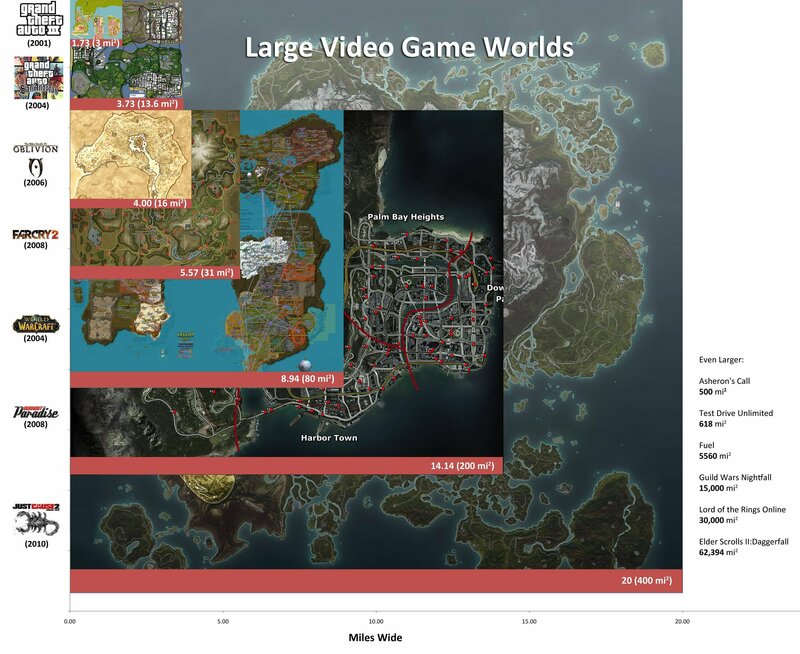 Is this the biggest f**king map in the history of video games?” Well, a Redditor named CourageousRobot has created a pretty amazing visual comparison of some of gaming’s biggest worlds. You ever wonder how San Andreas stacks up next to Azeroth? Well, now you can find out. Click on the image above or, alternately, this link to see it fully sized. CourageousRobot apparently got the idea to make the comparison while playing Just Cause 2, a game big enough to hide the whole island from Lost. He got his data from a number of sites like this one. Like always, video game fans have been quick to offer their support as well as arguing over every single detail of the picture in the Reddit comments thread. We, on the other hand, will just look at it and admire. And probably look up some warp codes.